PM Lee & DPM Teo were ranked 6th & 15th- beating the likes of the Saudi Crown Prince, Brunei’s Sultan Hassanal Bolkiah & Donald Trump! Pit this against the stark reality. Since the last General Elections, we have witnessed rising costs in water, carparks, ERP, conservancy charges, gas, electricity, public transport, childcare fees, tertiary institution fees plus impending tax & cost rises in digital services, carbon, diesel, healthcare premiums, sugar & GST. While the top leaders of our country go to bed every night knowing that their well-being is more than sufficiently taken care of, we have our elderly cleaning up tables & picking up cardboard boxes (One of our former Ministers even had the cheek to claim that this was a form of exercise) to eke out a living. This is why in the recently launched Singapore Democratic Party (SDP)‘s Cost of Living Policy, we have proposed to cut ministerial salaries to fund assistance schemes for the poor & raise income tax for the top 1% earners. Otherwise, the PAP’s last election campaign slogan “With You, For You, For Singapore” is but pure lip service & cheap talk. *Facebook post by Bryan Lim Boon Heng (林文兴). What are the use of your launches when the “Medeka Generation” don’t get to hear it or understand? I was at Hougang St 61 Coffee Shop the other day, and I ask one of the old man cleaner is the ward under WP Opposition party. He garbled something “no opposition” and someone at the seat mentioned GST will increase. To my surprise, the old cleaner said, “many people don’t understand, the GST is fair, everyone must pay for it, including ‘Foreigner’” I figured, what he want to emphasize to us is “Foreigner also pay”. I ask if he knew how much he is paying GST for 1 year as compared to his income tax and if he knew that he has to pay GST even if he is sick”. Sadly, he didn’t know. My God!. But after he knew, the bowed his head in desperation and look glum and confused and slowly pushed his trolley away. So, I say SDP will be in for another 5 years of disappointment. Better mobilize all your members to walk the talk and educate the “Medeka Generation” as they are the most prone as others “manipulated” instead of seating in the office and planning for launches. Launches to me indicates laziness fame harboring, that’s about it. Standing on the stage talking and teaching…….is only “self attention centering”. NOT ENOUGH.! WAKE UP!. Perhaps a lot of this merdeka generation aren’t internet savvy and rely on coffee shop talk or traditional media for info. There are a lot of runners whose jobs are to feed info to the ground. Lots of people won’t verify something because it came from official sources. Then again, I heard a lot of these cleaning companies are govt owned. I’ll leave you to fill in the blanks. Oppositions here have to play by PAP rules – which are makes it hard. Serve the nation or $ERVE $$$ N *emperor*? SERVE IS NOT SAME AS *RULE*. Here the way these bloke$ go about it seems more like RULE. You want ministers’ pay to be cut once again then you all have to show them a clear signal this year. Please hor, one GRC loss won’t result in a pay cut because they have already gotten over the psychological shock of losing a GRC so they are more prepared to lose 1 or 2 more this year. After all if they lose 2 it’s 2 ministers going bye bye only what, not 6 or 7 or 8. You make them lose more than they anticipated and this will definitely send shockwaves throughout the party. They will start thinking that in one fell swoop they lost so many ministers plus MPs and not only are their numbers trimmed down considerably there will be more opposition MPs voted in too. Triple whammy if you ask me. If this crystal clear signal is sent to them this year you can bet your HDB that these bunch of monkeys will not only sit up and take notice they will also not dare to anyhow increase everything under the sun as and when they feel like it. As long as they have the majority in parliament they won’t fear us one bit. Cut them down to size and see them squirm! How can he be worth only 100 million? Hsien Yang reportedly paid 50 million to him for Oxley Rise, dio bo? Minus that sum he only makes 50 millions in years of politics meh? Not forgetting the inheritance he got from the late Mr and Mrs Lee? Add another 0 to the figure is more realistic, IMHO. What’s more, their wealth are made from the tax payers. 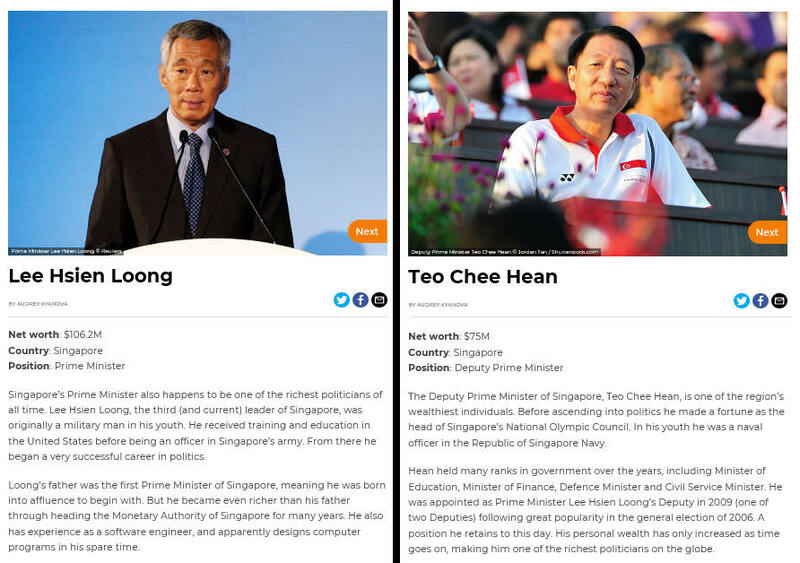 Some years ago when LKY was still alive, I read an article by Reuters saying that LKY is the richest man on earth and he was worth more than Bill Gates. Hours later, I was unable to see it anymore. I believe it was removed. So how could LHL be only worth 100M. This is fake news. Response: when HK Billionaire was asked whether he is the RICHEST man in this part of the world, he replied NO. He said that there is another Li FamiLEE many many time RICHER than him! Question is – do stupid people know the difference? For the coming GE. Singaporeans should just tell PAP one thing. “Show me the money!” “Show me the money!” How will Singaporeans get more money NOW to live a better life like the PAP politicians and senior civil servants? The writer is very afraid about being accused of spreading fake news, likely to change the “b” to “m” lah. I agree with the HK billionaire. If the rumors about his wife salary are true, then she would have made the equivalent of his entire wealth in 2 years and she has been at Temasick for 10 years or so! Teach the old man NEW GST knowledge and He will be very motivated to spread his knowhow to his group of kakis very quickly. Or “Merdeka free coffee corner” sponsored by SDP for example. Chinese saying, drink your coffee, talk your talk and spread your talk and free coffee. I chance upon a Malaysian saying that PAP’s ministers deserve their million $ salary, because they could earn more in a private sector. I asked her which Minister ever worked in a private sector. After months, I still cannot get the answer! I wonder why Malaysians were very smart in kicking out the person in-charge of 1MDB, but unable to know the salary paid to our Ministers were obscenely out of this galaxy? I can only think she was trying to be a Singaporean! As a result, Singaporeans’ intelligence is contaminated with these Malaysians’ stupidity! My only hope is these Malaysians could help kick out our PAP as they did to BN. Many Malaysians envy that Cow but that Cow envy the Malaysians. Why? Because its not easy to always say yes. Once lose focus wrong step break arm in a fall. This buddhist is praying everyday to redeem himself. God has been telling him everyday he disgraces himself & all Malaysians. NotMyProblem: I chance upon a Malaysian saying that PAP’s ministers deserve their million $ salary, because they could earn more in a private sector. I asked her which Minister ever worked in a private sector. After months, I still cannot get the answer! faking over what really r happening. This explains the total lack of democratic accountability with replacement by polanpa credit seeking protection! ‘Keep it up’: Malaysian, Singaporean PMs laud agencies probing 1MDB, : so reported Malay Mail but politely leaving out the huh Mahathir or his successor shall remember the kind cooperative gesture n shall return the favour when SIN has similar opportunity to do a cleanup operation. No wonder Mahathir has his last laugh over his old punchbag partner in regard of their presence when the nation is in deep soup. He has no problem but his old punchbag partner has but if the Buddhist scholars r right he may not have his full laugh cos he is in his own human form. Really imbercile digging his own grave.